BOSTON, Massachusetts, USA -- Wednesday, June 26, 2013 -- Free Software Foundation founder Richard Stallman today joins the ranks of notable individuals who have been inducted into the Internet Hall of Fame for their significant contributions to the advancement of the global Internet. Stallman has been named an Innovator, a category which recognizes and celebrates individuals who made outstanding technological, commercial, or policy advances and helped to expand the Internet's reach. Stallman had this to say upon his induction: "Now that we have made the Internet work, the next task is to stop it from being a platform for massive surveillance, and make it work in a way that respects human rights, including privacy." Richard Stallman is a software developer and software freedom activist. In 1983 he announced the project to develop the GNU operating system, a Unix-like operating system meant to be entirely free software, and has been the project's leader ever since. 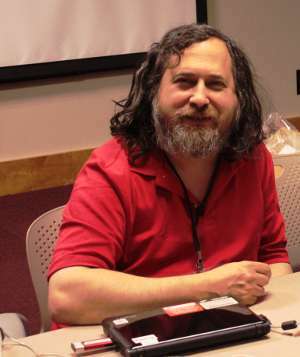 With that announcement Stallman also launched the free software movement. In October 1985 he started the Free Software Foundation. Since the mid-1990s, Stallman has spent most of his time in political advocacy for free software, and spreading the ethical ideas of the movement, as well as campaigning against both software patents and dangerous extension of copyright laws. Before that, Stallman developed a number of widely used software components of GNU, including the original Emacs, the GNU Compiler Collection, the GNU symbolic debugger (gdb), GNU Emacs, and various other programs for the GNU operating system. The Free Software Foundation, founded in 1985, is dedicated to promoting computer users' right to use, study, copy, modify, and redistribute computer programs. The FSF promotes the development and use of free (as in freedom) software -- particularly the GNU operating system and its GNU/Linux variants -- and free documentation for free software. The FSF also helps to spread awareness of the ethical and political issues of freedom in the use of software, and its Web sites, located at http://www.fsf.org and http://www.gnu.org, are an important source of information about GNU/Linux. Donations to support the FSF's work can be made at http://donate.fsf.org. Its headquarters are in Boston, MA, USA. The Internet Hall of Fame is an annual awards program that has been established by the Internet Society to publicly recognize a distinguished and select group of leaders and luminaries who have made significant contributions to the development and advancement of the global open Internet. More information on the program can be found at http://www.internethalloffame.org. Stallman announced in September 1983 the plan to develop a free software Unix-like operating system called GNU. GNU is the only operating system developed specifically for the sake of users' freedom. See http://www.gnu.org/gnu/the-gnu-project.html. The GNU Project relies on volunteers and individual contributions. To get involved, visit https://gnu.org/help/help.html.